If your dream week consists of learning from, listening to, and even jamming with acclaimed jazz musicians, this year’s GMF London Jazz Workshop and Music Festival was the right place to be. Taking over Pizza Express Dean Street for most of the week, the course offered a jam-packed schedule of instrumental lessons, sessions on broader musical skills such as time-feel and singing, and late-night jam sessions beginning at midnight. To complement a hard day’s work, the course also came attached with free nightly concerts for the students, often featuring the teachers in various line-ups. 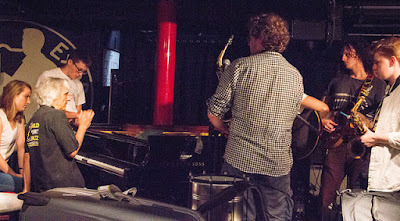 One of the unique characteristics of the course was that its faculty was made up of an international collection of musicians that one might not normally come across in the UK. Valencia-based saxophonist Perico Sambeat was there this year alongside fellow Spaniard Victor Jiménez, as well as guitarist Libor Smoldas from the Czech Republic. Italian-born Franscesco Petreni came to teach drums and percussion, whilst USA-based Bruce Barth taught piano. Accomplished British musicians also made up the other half of the faculty, with the likes of bassist Arnie Somogyi and up-and-coming singer and recent music college graduate Nel Begley. The entire course was directed by the Irish drummer Stephen Keogh, who as well as being a top jazz educator, has also performed with the likes of Lee Konitz and Brad Mehldau. Mornings at the course consisted of a series of workshops that focussed on a variety of different musical skills. Begley led a morning meditation session, which served to open up the awareness of the students and prepare them for the day that lay ahead. Petreni led the samba workshop, introducing various types of sambas with the aid of a host of percussive instruments. Guillermo Rozenthuler, an Argentinian singer and composer who now lives in London, led the group singing sessions, which taught the skills of singing rhythmically and in time whilst listening closely to one’s place in the harmonies. These fun and dynamic workshops then gave way to the instrument-specific classes, which took place in various other venues around Soho and Holborn. In the afternoon, the musicians were then placed into jazz bands where they worked on repertoire for the final student’s concert. After a long busy day, course participants could relax with a drink at Soho’s Pizza Express and experience concerts performed by their teachers, as well as visiting musicians. 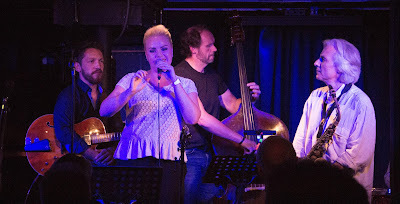 Sambeat performed a memorable gig of original compositions on the Friday alongside long-time friends Petreni, Keogh, and Mark Hodgson on double bass, whilst Lithuanian-born Viktorija Pilatovic sang an electrifying set on the Saturday. There was also a 'Rising Stars' concert led Begley on the Sunday, where young musicians on the rise could showcase their achievements to a new audience. This included Roz Macdonald and Sam Ingvorsen on bass, and Gwilym Jones and Jordan Dinsdale on drums, names to watch out for. The evening gigs were then immediately followed up by jams, where students inspired by a day’s jazz could experiment and play alongside other teachers and students alike. The high musical calibre of the visiting teachers ensured high standards. And yet, the GMF course also maintains a consistently relaxed and friendly vibe. It was a privilege to have been a part of it.